Following the March 2016 release, the Salesforce Legacy connector, which is deprecated since the August 2013 release, will be removed from CES 7. The main reason behind this remove is that the legacy connector uses the Winter '12 API (version 23.0), which may no longer be supported since Salesforce guarantees three years support for their APIs (see Metadata API Support Policy). 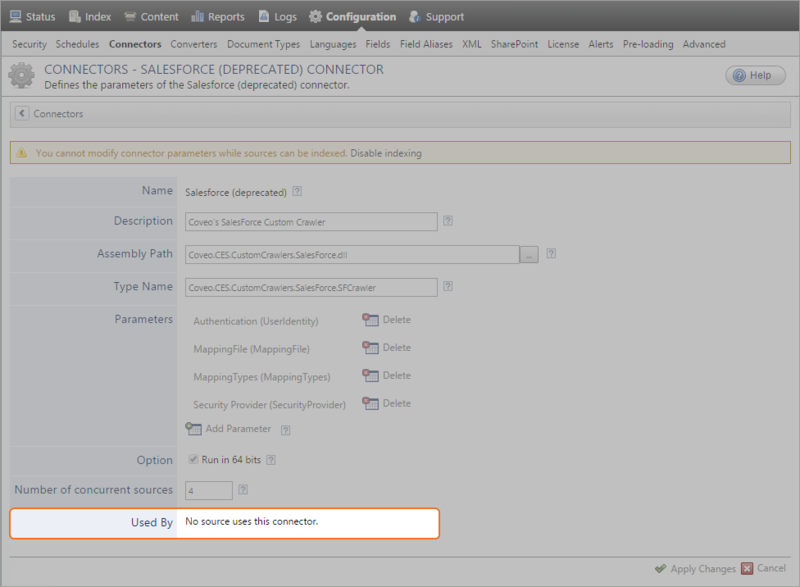 If you index Salesforce content using the Salesforce Legacy connector, it is thus strongly recommended to now use the second-generation connector for Salesforce (see Salesforce Connector). Contact Coveo Support for assistance on creating Salesforce sources. In the Connectors page, select Salesforce (deprecated) (CES 7.0.7814+ (August 2015)) or Salesforce Legacy (CES 7.0.7711– (June 2015)). In the Salesforce (deprecated) Connector or Salesforce Legacy Connector page, next to Used By are listed the sources (if any) that use the Salesforce Legacy connector. Create a Salesforce source for each of your Salesforce Legacy source with Coveo Support help.